Almost five years ago, a committee was set up by the central government to draft a new law on the rights of persons with disabilities—a law that would encompass the spirit of the UN Convention on the Rights of Persons with Disabilities (UNCRPD). The Rights of Persons with Disabilities Bill was drafted in 2011, after national and regional consultations. While the 2011 Draft Bill was far from perfect, both the 2011 draft and a slightly altered 2012 Bill, were largely accepted by most disability rights groups and presented to the government. The government completely watered it down in its version of the 2014 Bill. When presented in Parliament serious objections were raised, which led to the 2014 Bill being referred to a Standing Committee. Sadly, in its recent report, the Standing Committee fails to address some of the controversial portions of the Bill and instead convolutes the way forward. Moving on from the title of the Bill, the Standing Committee’s response to three main issues—the medically focused definition of disabilities, exclusion of the private sector, and its negation of the right to live within the community — also need to be examined. The UNCRPD adopted a broad definition of persons with disabilities in Article 1 as being “those who have long-term physical, mental, intellectual or sensory impairments which in interaction with various barriers may hinder their full and effective participation in society on an equal basis with others.” While this definition was incorporated in the 2011 and 2012 drafts of the Bill with respect to equality and non-discrimination provisions, the Bills of 2011, 2012 and 2014, respectively, have restricted the provision of benefits and reservations in employment, education and other rights only to persons with 40% of certain ‘benchmark disabilities’. These benchmark disabilities were listed as 19 medically recognized mental and physical disabilities in the 2014 Draft of the Bill. In its report, the Standing Committee has advised an expansion of the list to now include 13 more disabilities such as kidney failure, blood cancer, diabetes type-I, and more. The continuous expansion of the list of recognized disabilities is evidence that no comprehensive list is possible. Keeping this in mind, the UNCRPD, and in fact most other progressive disability rights legislations around the world, advocate a definition that does not include any list of medically defined disabilities. This would ensure that all persons with disabilities, regardless of being included in a list, will be recognized for having impairments that hinder their effective participation in society, entitling them to all the rights enshrined in the law of persons with disabilities. It is crucial that the debate be redirected from a medical model of disability that depends on a list of defined impairments to a rights-based model, placing emphasis on the removal of barriers. Any disability rights legislation is meaningless unless it covers the private sector. The 2011 and 2012 drafts included private bodies in the definition of “establishments”. This meant that all provisions under the Bill would be applicable to the private sector, including, most crucially, the provisions of education and reservation of jobs for persons with disabilities. This definition was completely hollowed out in the 2014 Bill, in which establishments are limited only to bodies established, controlled or aided by the government. This watered down definition of establishments to include only the public sector makes the new Draft just a revised version of the present Persons with Disabilities (Equal Opportunities, Protection of Rights and Full Participation) Act, 1995, which only provides education, employment and other rights vis-à-vis the government, and would be nothing more than old wine in a new bottle. The Standing Committee, pointing out that this particular separation of the public and private sectors is outdated because many public functions are outsourced and provided by semi-private institutions, importantly makes a recommendation to include private establishments within the ambit of the law. However, the Standing Committee has completely ignored the right to live in the community, better known as the right to independent living. Article 19 of the UNCRPD sets out the rights of persons with disabilities to “live in the community with choices equal to others,” so that all persons with disabilities can live independently within the community without being relegated to care homes. 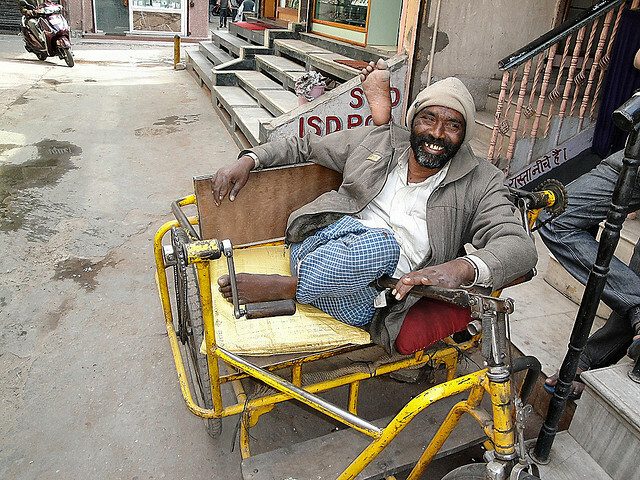 The 2011 and 2012 drafts incorporated a distinct right of all persons with disabilities to live independently within the community, mandating that the government launch schemes for community based rehabilitation. While the concept is preserved in the 2014 Draft of the Bill, the right-based nature of the provision is completely watered down. The 2014 Bill states that the government shall only “endeavour” that persons with disabilities are not obliged to live in any particular living arrangement and are given access to residential and other live-in support “within the limits of economic capacity.” Making this right subject to the economic capacity of the State ensures that it will never be protected. This is the reality with the existing Persons with Disabilities Act 1995 which has similar provisions relating to accessible transport and road facilities being subject to the economic limits of the government. Even today, after almost 20 years of the law being in force, we still do not have accessible buses, trains and road facilities for persons with disabilities. It is unfortunate that the Standing Committee Report does not comment on this important dilution or make recommendations to strengthen this right. There are many other provisions that the 2014 Bill needs to address, such as provisions on women and girls with disabilities and the right to legal capacity and plenary guardianship. To move ahead, the onus lies on everyone who has any interest in the Bill—persons with disabilities, disability rights activists, civil society, academics, and the State—to ensure that these crucial provisions in the Rights of Persons with Disabilities Bill are addressed, that the 2014 Draft is suitably amended, and that the Bill is finally passed. We have been waiting far too long for successive governments to pass a progressive legislation for persons with disabilities; it is high time that a meaningful law is passed. The authors are with the Centre for Law & Policy Research, Bangalore.